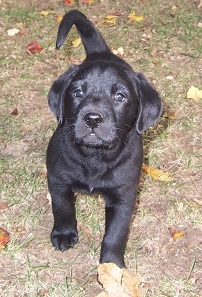 Home › Training › Give up the guilt and raise a great puppy! Give up the guilt and raise a great puppy! To all the guilt-ridden mothers out there, please read the following. As I prepare to say good-bye to Autumn’s puppies in a few weeks, I think the time is perfect for me to share my views and advice regarding crate training. In large part this is motivated because Autumn’s puppies are bursting with the Labrador gene that promises chewing for the next year or two but moreover because they are PUPPIES! Puppies chew. Puppies get into stuff. Puppies poop and pee in places that we’d prefer they not and often exactly where you’ll be walking in the middle of the night to go pee yourself. As such I believe in the crate. Just like I believe that the first sip of your first beer is the best, that people should always have their checks completed well before their groceries are all rung up, that the best part of the day is at 6 a.m. and that puppy breath is one of the sweetest fragrances on earth. EVERY puppy needs leadership, guidance, directions and limits very early on as much as they need food, water, cuddles, snuggles and belly rubs. Okay I’ve never heard that last one but that’s only because most people don’t say everything they think. So here’s my question to the mother’s out there…. mostly. When your children were young, let’s say 2 years….old enough to be up and about and getting into mischief, did you feel bad putting them in a playpen or limiting what they could get into or hiring a babysitter to watch them while you were gone or not letting them play with knives? Did you feel bad for not letting them roam the house alone or put everything in their mouths they wanted? Did you feel bad telling them “no” when they did things that were dangerous? And did you feel bad for wanting to teach them right from wrong so they’d grow up to be responsible, safe and happy human beings? If the answer to any of those questions is “yes”, then stop reading cause you’re not going to get my point at all. If you aren’t or weren’t the sort of parent that understood that you would have to do things that were hard or made your child unhappy in order to be a good parent, I cannot relate to you and this blog will likely not resonate the way I want it to. Normally I don’t do puppies or not for long. Foster them, yes! Adopt them, no! But somehow I’ve landed with two older puppies…7 to 9 months of age each, Oliver and Abby who remind me daily of why I adopt older easier dogs normally. They’re wonderful and about 75% trustworthy not to get into stuff. BUT assuredly they do not get free reign of my home. They have limits and boundaries that my older dogs don’t need. As such, they stay in the garage during the day and will probably do so for the next year. My point is, that our puppies need and deserve some rules just as much as they need food and water and one should not feel any more guilt about providing them with those boundaries than giving them the sustenance they require. In large part I believe many of the dogs that end up in shelters are there because their owners simply did not give them the limits they needed and they grew up to be “bad” dogs when in fact they had “bad” owners. I don’t really think either are bad, just my way of making a point. So mom’s out there…those that are and soon to be (Debbie!) STOP feeling guilty about giving your puppies exactly what they need. Stop humanizing them and thinking that if you were in that crate you’d feel such and such. Think more about how you deal with a 3 year old child who was eating the wood work or chewing everything plastic in your house. My first dog as an adult, a Lab named Spinner ate 5 remote controls during her puppy stage before I got a crate and before she gave up the habit at 2 years. She also ate part of an antique table, a plate of chocolate (my first doggie enema application), and about 5 cassette tapes before I started doing my job. I’m lucky she didn’t ingest something that killed her…the tapes could have. And had she been injured or worse, it would not have been her fault. She was just being and doing what puppies are meant to do. It was I that was failing to do what I was supposed to do…be a responsible owner. Responsible mom, leader and protector. Don’t wait until you’ve had to do that puppy enema or rushed your pup to the vet in the middle of the night because they are throwing up rocks or whatever the catastrophe that will put you over the edge. Get a crate. One large enough for your puppy to grow into over the next 6 months or even a year. Or find a safe place in your home or garage for your puppy to call home (their private puppy pad) when they cannot be supervised. And be consistent about its use. Please don’t put them there as punishment. It should always be seen as a comforting happy place. Feed them there. Give them toys and treats there. Put it somewhere they will continue to be a part of your family rather than isolating them in the laundry room or basement. When you put the crate in a room far from the normal traffic flow or activity, you’re doing that so you don’t have to hear or see them. They will not feel better about this isolation even if you do. Over the long term they will be happier in their crate when they still feel a part of what’s going on. There are tons of good articles about how to crate train and I won’t repeat all of that advice here. Google will lead you to that. But please consider getting one. It’s not just about saving the furniture from destruction. Or saving you money on the unnecessary vet bill. It’s about being a responsible owner, leader and pet parent. Our puppies need it just as much as our children. Right moms? And if you want to feel guilty about something, wait til your pup is grown up and no longer needs the crate and after you’ve put it away comes and looks at you with a “Hey, what’s up? Where’s my crate?” look. Then feel all the guilt you like. Til then be proud of yourself for being a responsible pet owner raising a well-balanced and happy puppy to adulthood. Carrie………Am I the Debbie you were referring to ? I totally believe in crates. 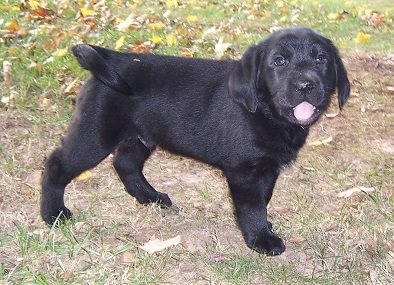 We had 2 black lab pups years ago that ate an entire room of furniture in 5 minutes ! 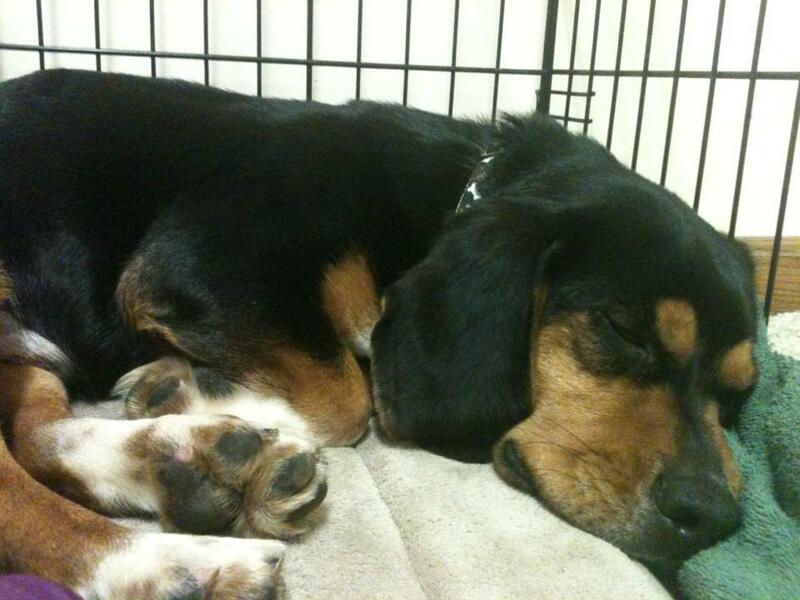 Oscar or Wally or whatever name we decide on will have a crate. Fred will be the “softy” in the middle of the night if he cries ! Yes you are my soon to be mom…the only one I know right now so you are more symbolic as I know you are crate savvy. More for the other people who might be considering these puppies or any puppy for that matter who are not. And have the feeling after Fred’s visit he might be the softie after all…insert Fred for Debbie in appropriate paragraph!!!! Am excited for Wally Oscar to join you all and start hearing the stories of his adventures with you and yours! Thank you, I needed to read this! My husband and I just got a puppy. We already have a 4 year old dog that I love to death, but I didn’t raise him . Bella the puppy is my first dog ever, I’m trying so very hard to be the best possible owner and mommy to her. I am fortunate enough to be a stay home wife for a couple of months, so I feel specially bad when I have to put her in the crate, because I have the time yet not patience to watch her like a hawk all day, by the end of the day I’m exhausted!!! I’ve googled a lot, but was wondering if you could help me. Right now we are putting Bella in a crate (big enough, besides our bed) for 2 hr intervals and then she gets out for 30-45 mins to go potty and play. Is that ok? am I taking her out too often? should I just step up my game and let her out more often while I watch her? Barbara – Sounds like you have a good routine. Depends on how old Bella is and how active she is. But setting up and keeping with a good routine is always a good practice. You should certainly find that if she’s 12 weeks or younger, that she still needs and wants lots of sleep. As she grows older, she’ll want less sleep thus less time in the crate and more time out and about. But using that crate as a good place for her to hang out, eat, get toys and treats is a very good start and you should not feel badly about crating her as long as you’re not using it for punishment. It should be her den and a place she eventually will choose to go on her own just because its HER place. Good luck with your puppy! thank you! She just turned 12 weeks old. She is veryyyyyyyyy active and bearly sleeps, I’ll try to get her to sleep more. Also, she isnt very good at eating her food, although we just took her to the vet and she is fine, yet she will try to eat anything and everything else. I’m glad I found you and read this. I have a five month old puppy we adopted when she was two months. I am crate training her and have felt guilty about it, but am conntinuing to do so. I have found what helps me is I exercise her real good before she goes to her den. My husband is home during the day so she doesn’t need to be in it except when we go out and at night she sleeps in it. I was reading what you said about not allowing children free reign and I agree. I know if I just let her out and about she would get into trouble and I would be to blame not her. Just trying to do the right thing by her. Still learning. Thanks. So i’ve always had dogs but thankfully my dad is an early bird as has always been up at 5am to let them out, feed them and play with them. Now that I live alone and have my own puppy she is breaking my heart. I work from 4pm-10pm usually and have to put her in her crate while I’m gone so she doesn’t destroy my apartment. I take her for a walk when I get home, but lately I’ve had no choice in her house training but to keep her in a kennel at night. She’s almost 4 months old, a husky and if I leave her out to roam at night, as I was doing before, I wake up to poop and pee everywhere and she’s getting too big for those droppings to be manageable. I feel l come home and let her out for a walk and then shove her right back in her kennel. that said it’s a large crate and I’ve put a blanket over the floor, several toys and occasionally food if I don’t feel like she’s eaten enough. But the dog is breaking my heart . I feel like I’m ruining her life shoving her in there but I’ve tried pinning her in the bathroom and she destroys the place. Any advice would be appreciated! She’s my baby I don’t want her to spend this much time bared away but I don’t know what else I can do until she’s house broken. You have a dog that requires both physical and mental stimulation by breed AND certainly by age. A tired puppy will do better when left alone but is not easy for a Husky who has boundless energy to burn, a need for variety and will not be easily entertained by a backyard where things do not change. Activity, variety, learning exercises, and lots of it is absolutely essential for your dog! Cannot say it enough. The breed itself is a demanding one and can be destructive without such activity. I would suggest lots of research on the tendencies of your dogs breeding just to get up to speed if you haven’t already. But if you have already you surely know how important these things are. Toys are not enough. You will need to focus considerable time on giving your girl this kind attention to ensure that she grows up well and balanced. Thank you so much for this. I got my first dog a month ago, he is 9 months old. I was feeling guilty and anxious about the crating when I leave and wasn’t sure if it’s the right thing. It’s also the holidays so we are waiting till January for our training courses to start and I feel alone and lost with no one to ask if I’m doing the right thing. I stupidly recorded my dog while I was gone and heard him crying, he lives his grate and doesn’t have that problem at night, is this just him getting used to being alone? Should I leave the radio on? He has bones and a Kong with him and so far have only left him 2.5 hours tops. I will have to work soon though so it will be up to 5 hours but will probably hire someone off Rover to let him out half way. Thanks again! Hi. Sounds like you are using the crate exactly as it should be…making it a happy place and using it not only when you are gone but at night too. The fact he cries some when you are gone could be attributed to several things. He could be hearing things and that is his reaction. Unless crying has previously gotten him released from the crate (a habit I try to discourage) it is likely he hears, sees or smells something thus causing him to have a verbal reaction. Unless he acts stressed, upset and anxious when this happens, I would not be at all concerned. The radio or TV might be a good distraction or cover other noises that might cause him to become concerned. I had a Beagle once that really seemed to be soothed by the TV and since the TV was always on when I was home, turning it off when I left certainly alerted him to my impending absence so I left it on. I could tell a difference in how we behaved almost immediately. So give it a try. 2.5 hours is not excessive at all but as I always suggest, making sure your dog gets plenty of exercise so that he is not full of himself when crated will go a long way to making the crate a happy place for him and for you too.